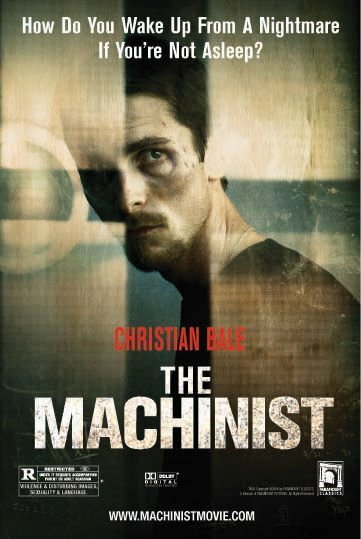 The Less Desirables Movie of the Week, brought to you by a/perture Cinema, the Official Movie Sponsor of The Less Desirables, is The Machinist (2004) starring Christian Bale, Jennifer Jason Leigh and Michael Ironside. The film is directed by Brad Anderson. Trevor Reznik (Bale) is a machinist.He has insomnia of the worst kind. This has led to his becoming emaciated. Everything about him creeps his co-workers out. They eventually turn against him completely when he accidentally turns on a machine that causes his coworker, Miller, to lose his left arm. Trevor claims that he was distracted by an unfamiliar coworker named Ivan. The problem is that no one at the factory knows an Ivan that works there and no one has records of him. Trevor’s only solace seems to be Stevie (Leigh), a prostitute who really likes him, and with Maria, a waitress at an airport diner he eats at almost every night. A string of weird post-it notes appear on his refrigerator, one that he didn’t know where it came from, depicting a game of hangman. As the film goes on the letters, and the segments of the hangman body start filling in. Trevor goes to a theme park with Maria and her son to try to “get in good with her,” finding some peace with her. He and the son go on a “house of horror” ride and the depictions in there are overly scary and gruesome and depict odd similarities to Trevor’s life. Also, the strobe lights sends the son into an epileptic seizure. This makes Trevor fall deeper into the mind muck because he can’t think clearly. Seeing Ivan at random locations, he begins to think this is a conspiracy against him. Trevor finds Ivan in a bar and they talk; weirdness. Ivan leaves his wallet behind and he finds a picture of Ivan with a co-worker that has it out for him on a fishing trip. Trevor is involved in another machine accident and this time it’s his own arm that almost gets hit. He throws a fit against his co-workers, blaming them for the accident and bringing up the picture with the co-worker and Ivan. He’s fired. He forgets to pay his utilities and the power is cut off. Goop drips from his freezer but he ignores it, seemingly. Trevor tries to get Ivan’s license plate (he drives a souped-up muscle car). He goes to the DMV to try to get an address of his “friend” but the DMV officer won’t give him any info unless there’s been a hit-and-run. Trevor throws himself in front of a car and goes back in the DMV to report that there has been a hit-and-run. He finds out that the plate was his own and that he had reported the car stolen a year ago. What was that goop in the freezer? What was Ivan doing with his car? Why wouldn’t couldn’t he find Maria? When would Trevor get any sleep? All those answers you’ll find out when you watch the film. I’m not giving that away. Christian Bale had to get very thin for this role. He lost 62 lbs by eating a diet consisting of water, an apple and one cup of coffee per day, with the occasional whiskey (approximately 55-260 calories). This according to an article in Huffington Post. He got down to 120 lbs total weight. He wanted to go to 99 lbs but the director stopped him, citing health hazards. The remarkable thing about this isn’t the loss he made but that it was just six months prior to him playing Batman in Batman Begins and we know he was bulked up and toned for that role. He did that by weightlifting and binging on pizza and ice cream according to the Daily Mail. The character model of Trevor is a lot like Patrick Bateman from American Psycho, also played by Bale. It’s a wonder he didn’t flip out after all that. I know he had some anger issues around the time he played Batman but I’d figure this would have done it first. My descriptions here can’t do the thrills aspect of the film justice and you spend a lot of time anticipating how the thing ends, even if you figure out the ending before hand. Rotten Tomatoes has it as 77% Fresh and an audience score of 81%. Not usually do you see the audience score higher than the critics score, but it was well received. I really liked the film. The first time I watched it I slept through it. This was not the case this time. I recommend it for those who like psychological and very, very dark thrillers. I watched it on Netflix and I rate it 4 Stars. Do you agree with me? Let me know. Also, what do you want to see or hear me review?